What are your favorite things to buy at Trader Joes? Share your favorite finds with others and see their favorite picks too! Use the form below make your suggestions or to rate what others have added. Feel free to add anything you love to buy from the deli, the produce section, the frozen food section... If they have a private label item that you think is great, let us know! 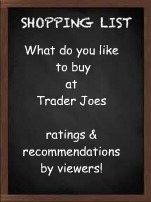 What Do You Love To Buy at Trader Joes? What's in your grocery cart. Please share any fabulous finds that you would like to recommend to others! Easy to make; kids love it. Great for our son with Autism, and the price is much better then other stores. Nice side with good spices and easy to warm up.